The Calgary Flames announced Thursday that they have signed forward Mikael Backlund to a one-year contract worth $725,000 US. Backlund had four goals and seven assists in 41 games for Calgary last season. He has 15 goals and 31 assists in 138 career games with the Flames. 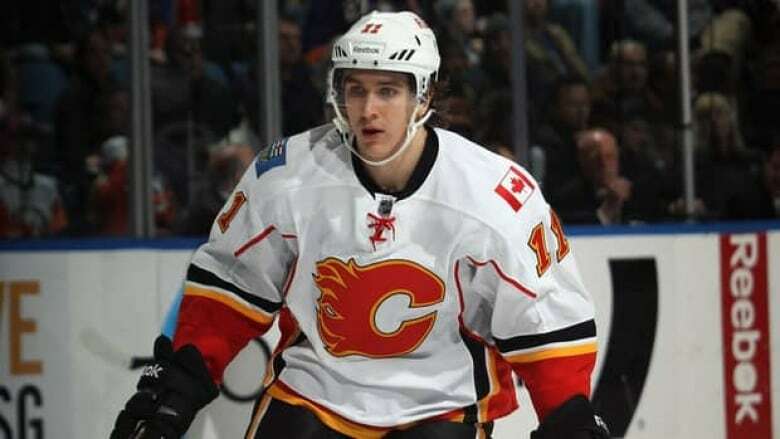 The native of Vasteras, Sweden, was the Flames' first round pick (24th overall) in the 2007 NHL draft. "Mikael has an opportunity to step up and attempt to secure a top two-line centre position with our club," Flames general manager Jay Feaster said in a statement. "He is a very talented player who skates well, has excellent vision and possesses a strong skill set." The St. Louis Blues have come to terms with restricted free agent David Perron, signing the 24-year-old winger to a four-year, $15.25 US contract on Thursday. The six-foot, 200-pound winger had 21 goals and 21 assists for 42 points last season. Despite missing 25 regular-season games with concussion problems, the Sherbrooke, Que., native was the second-leading goal scorer and fifth-best point producer on a Blues team that finished second in the Western Conference before falling in the second round of the playoffs. "We're excited to have David in the fold for the next four years," Blues executive vice president and general manager Doug Armstrong said in a statement. "He made a great comeback by scoring 21 goals in 57 games. We're comfortable with his health, and we're confident that he will continue to build on his offence." Perron has recorded 74 goals and 99 assists in 292 career games since the Blues drafted him 26th overall in 2007. Prior to that, the winger played his junior hockey with the now-defunct Lewiston Maineiacs of the Quebec Major Junior Hockey League. The Washington Capitals re-signed centre Jay Beagle to a three-year deal worth $2.7 million. The 26-year-old restricted free agent had four goals in 41 games last season. He also won 57.7 per cent of his faceoffs, ranking second on the team. Beagle was signed by Washington as an undrafted free agent in 2008. He has seven goals and three assists in 82 career NHL games. The Edmonton Oilers continued to firm up their roster on Thursday, signing restricted free agent goaltender Devan Dubnyk and defenceman Jeff Petry to two-year deals. Dubnyk won 20 games in 47 appearances for the Oilers last season. The six-foot-five, 210-pound goalie had a 2.67 goals-against average and .914 save percentage. The 20 wins and 2.67 GAA were both career bests. Dubnyk was Edmonton's first round choice, 14th overall, in the 2004 NHL Entry Draft. The 24-year-old Petry played in 73 games for Edmonton last season with two goals, 23 assists and a minus-7 rating. He ranked first on the team in scoring for defencemen, reaching career highs in goals, assists, points and games played. Petry was Edmonton's first pick, 45th overall, in the 2006 NHL Entry Draft. The Oilers also agreed to terms with left-winger Dane Byers on a one-year contract. Byers spent last season with the Columbus Blue Jackets and their main affiliate, the Springfield Falcons of the American Hockey League. He had 16 goals and 23 assists with 108 penalty minutes in 61 AHL games last season. Byers also appeared in eight games with the Blue Jackets collecting 29 penalty minutes. Defenceman Frederic St. Denis has signed a one-year, two-way contract with the Montreal Canadiens. The Vancouver Canucks have added some depth to their defence, signing Derek Joslin and Patrick Mullen on Thursday.